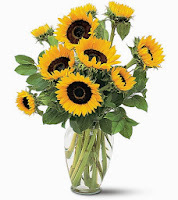 Sunflowers are a great choice to send during the cold winters in Canada, as they light up any room they're placed in with their vibrancyThey also have quite a fascinating history if you're interested in learning about them. First, cut 3 centimetres off of the stems, and remove all the leaves that are below where the water line will be in your vase. Fill the vase with water and add a packet of flower food to give your Sunflowers the nutrients they need to thrive. On the fourth day, re-cut the stems, replace the water with some fresh water and as you did before, add a package of flower food . Removing the leaves that are spent is a great way to maintain the freshest appearance. Place your sunflowers in an area where it won't be subjected to a lot of heat, or drafts of wind. That means you should be careful if you're planning to place them near windows, radiators or the like. We hope these tips help you enjoy your flowers for as long as they'll last! We offer similar tips here, tailored toward roses. Heading to a housewarming party by any chance? Here's 10 of our favourite gift suggestions. If you're having to give a gift in November, we know you don't want to spend a pretty penny. Save some coin up for the holidays with one of these ideas. Sunflowers are a great choice to send during the cold winters in Canada, as they light up any room they're placed in with their vibrancy. They also have quite a fascinating history if you're interested in learning about them.